Set in the years of the Great Depression, World War II, and the Post-War Era, this engaging story follows the life of Gabrielle Picard, a weaver in the great Ponemah Mill in Taftville, Connecticut. Work in the mill allows her family to participate in the American dream. The photographs are remarkable. Gay dancing on the dirt pile where their home is being built exemplifies the character of this heartwarming book. What an intriguing story about one family’s immigration in 1924-to a new world and better life. Filled with insights about their years in Taftville and mill work in the Ponemah era. It was the title of this book that caught my eye, causing me to back up and take another look. A good book title can do that can’t it? The Ponemah Years – Walking In The Footsteps Of My Mother. I was instantly intrigued. I suppose that as I am now wading into middle age, I find myself pausing more frequently, pondering my life. This season is different than the younger years, when I found myself looking ahead, to all of the possibilities of the future. Now, I find the subtlest change. I find myself looking back in time a little more, not in regret, but in curiosity. There is a sort of awakening as I approach these years. I identify with my parents in a way that I never could have before. I find myself considering the events that influenced them into who they were and are now. My maternal grandparents passed on a few years ago, and I’ve been quietly observing my own mother, and how that experience has and is shaping her. That also finds me pondering my own relationship with my mom, and it’s trickling down as I consider what memories my daughters will carry with them, about me. It is that nostalgia, that drew me to this book, like a magnet. I’m trying to determine which category to place The Ponemah Years – Walking In The Footsteps Of My Mother in, and I’ve come to the conclusion that it’s in a class all of its own. You’ll find a blend of biography, history, documentary, family scrapbook, and more. 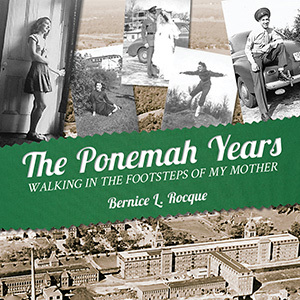 Author Bernice L. Rocque was a genealogy enthusiast for many years, researching her extensive family history. She made the decision to focus her search on the history of her parents, more specifically, her mother, after taking a walking tour called, “WALKTOBER” with her mom in the fall of 2004. “WALKTOBER” is a walking tour in Taftville, Connecticut that allowed people to tour the inside of the Ponemah Mill, which was a focal point of the town, and a huge influence on the author’s mother throughout the years between 1937-1950. Rocque traces her maternal and paternal family’s French Canadian and Eastern European roots, respectively, to their ultimate destination in the Eastern United States. She recounts the early childhood of her mother, the budding romance between her mother and father during WWII, and the process through which they settled down to create a family of their own. The book is filled with beautiful photos that are sure to evoke interest and nostalgia in the reader. It is a heartwarming account of life in the early to mid-1900’s. We get a sense for the values held by this family – a strong work ethic, commitment to family, and a positive attitude. Interestingly enough, you can also trace the journey of the author herself, as she discovers pages of her mother’s story that she had never read before. She learns that there was more to her mother than the homemaker that she and her siblings remember, as valuable as that was. She too was once a young woman, excited for her future, who loved her job as a weaver in the mill. Not to suggest in any way that her mother was bitter or full of regrets. Not at all. It was the maturity of her mother, having the eyes to see what was the most important thing for her family. There is a quote from the author that struck a chord in me,“My mother’s essence has become clearer from hearing…recollections.” Yes, this! My daughters, ages 12 and 14 years, all read this book. We enjoyed it immensely. My daughters like the layout of the book. After the introduction, the book is divided into two parts. It is a very quick read, and easy to understand. This could easily be used alongside your history or social studies work, and even completed within a week. You might even stretch it out longer, depending on how deep you care to dig. We easily read through it thoroughly within a few days. Of course, speaking for myself, that was because I didn’t want to put it down. My 12-year-old loved all of the photos. She appreciated having faces to accompany the story. Those characteristics also appealed to my 14-year-old, who often takes on history with reluctance. A great addition to your library, whether for educational purposes, or a leisurely trip back in time. I can’t recommend The Ponemah Years enough.